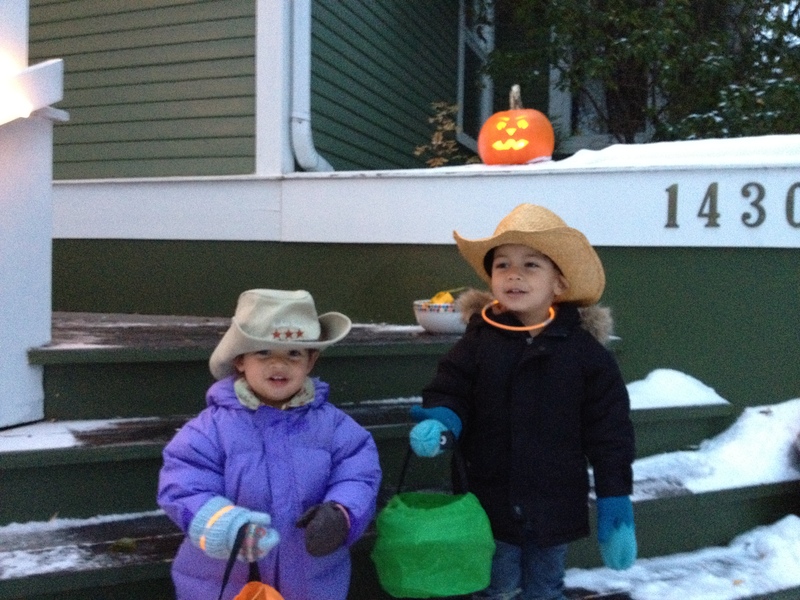 After two solid weeks of sewing at every free moment I had, I finally finished the kids’ cowboy shirts. What a pain! This was my first time following a pattern as all previous sewing projects had been from tutorials. Let me tell ya, “Simplicity” it wasn’t. Talk about false advertising. I swear that pattern was written in a foreign language that just resembled English. I had to call my sister on a number of occassions, and looked things up on the inetrnet a lot. But I persevered and ended up with a half-decent finished product. The second shirt went much smoother since I had already done it once, though I still found myself scratching my head in some of the same directions. I’m really glad I did it though as I have plans to make the kids’ Christmas outfits, outfits which will hopefully now turn out better for the experience I’ve gained. Still, I have a feeling there will be a lot more hair-pulling and frantic calls to my sister to come. 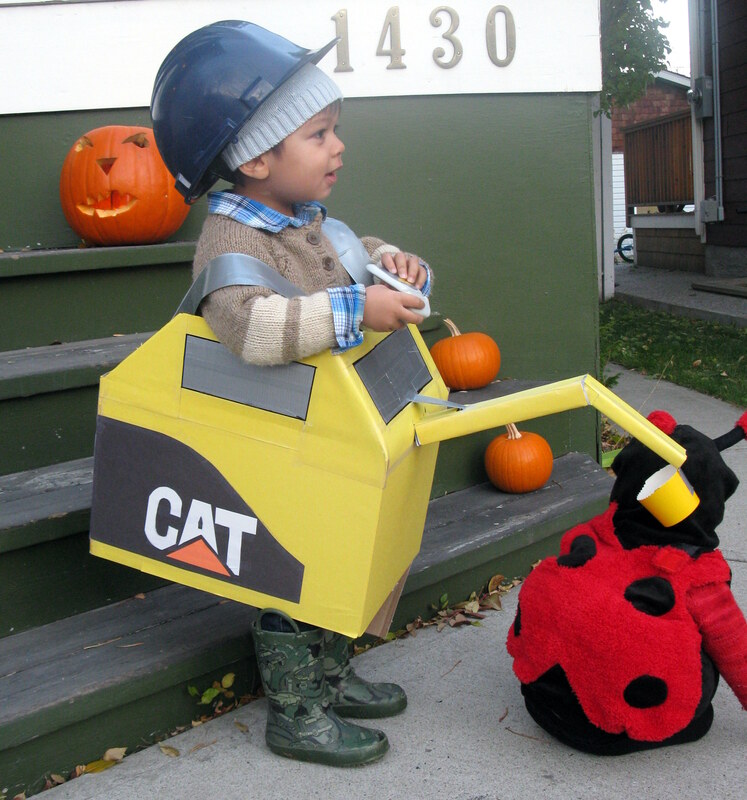 What the costumes looked like. What they looked like to everyone else. Okay, this happened a few weeks ago but I’ve been unable to talk about it until now. The sweater in question has been sitting in a basket in a corner since I threw it there and stormed off. I think I have cooled down enough and my head is fully level again so it is time to revisit the disaster that was my first foray into steeking. 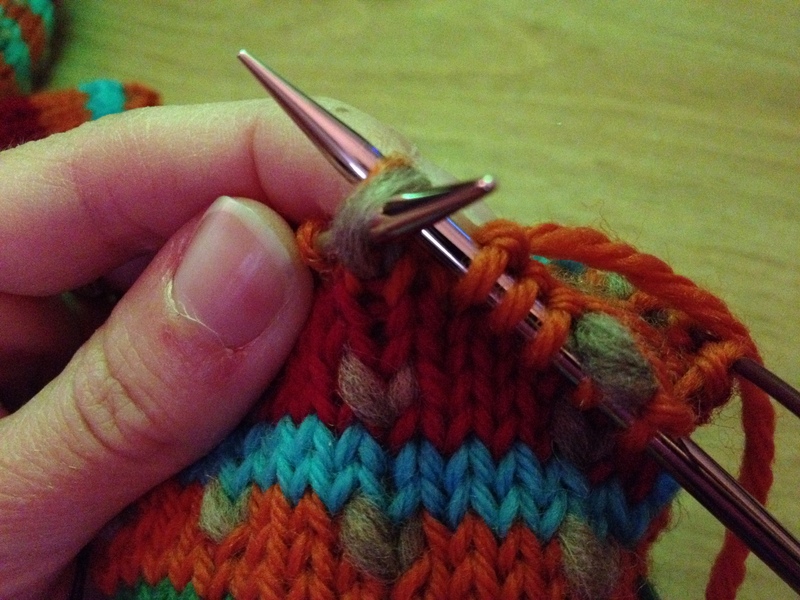 Steeking is a technique used when knitting stranded colour-work in the round. 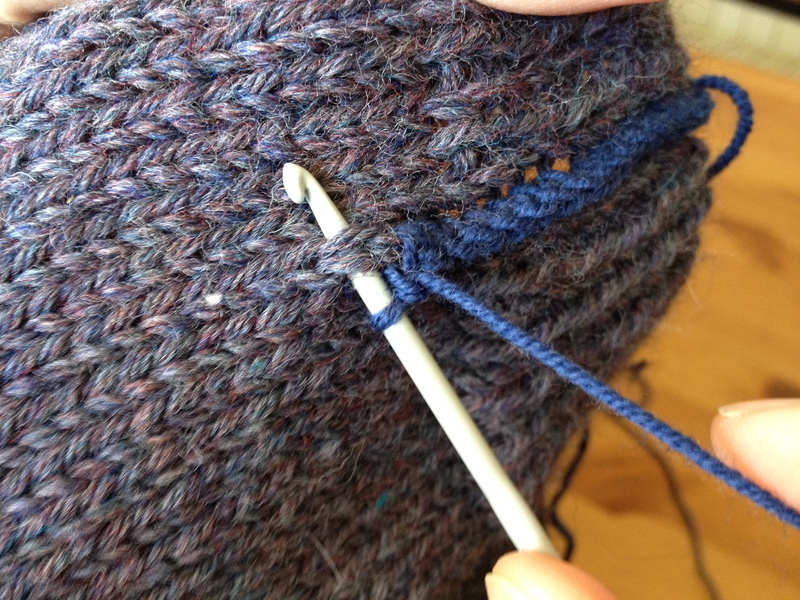 Since it can be difficult to purl while knitting with two colours, many knitters prefer to work in the round when doing stranded colour work. But, working in the round means you are making a tube when sometimes you’d rather have a flat piece. In the case of my sweater, I wanted to make a cardigan so I needed it to be flat. 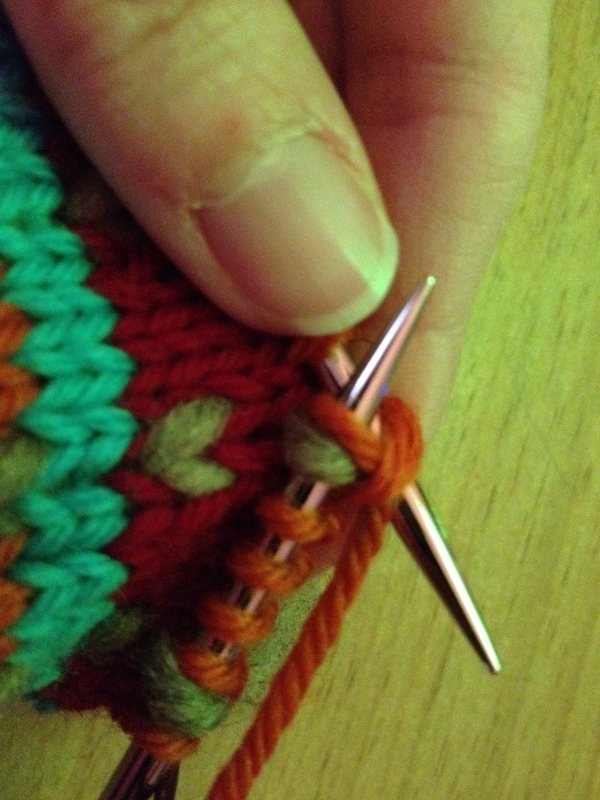 In order to turn this tube into a flat piece you do something very scary… you cut your knitting right down the middle! Oh the horrors! 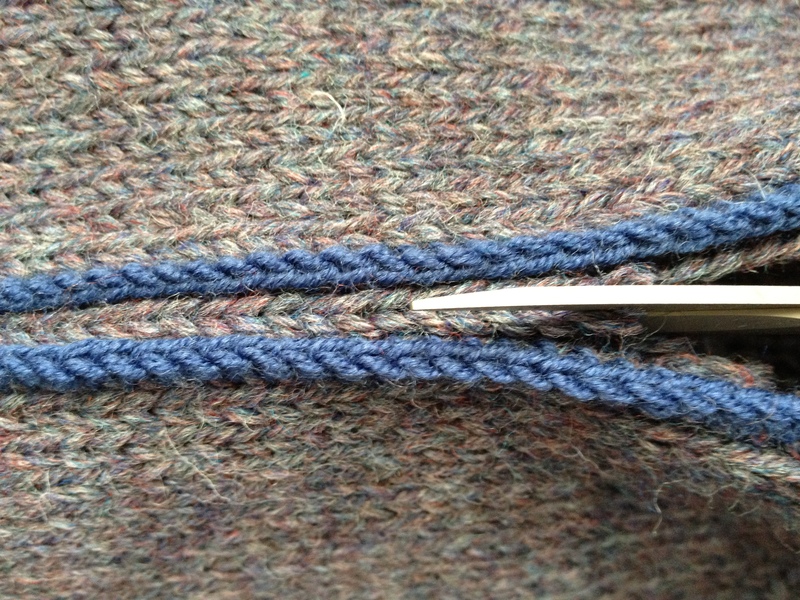 Before you cut your work you reinforce the column of stitches on either side of where you are about to cut. This is where the people are a little divided, and where I guess I didn’t do enough research. 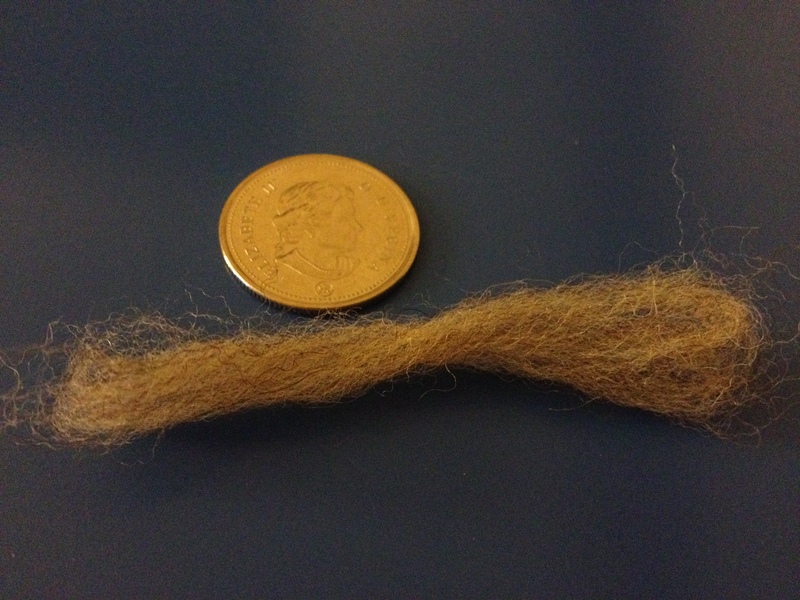 In theory, if you use a true Shetland wool (which is traditional for this style of knitting) then the catchy wool can grab onto itself and not unravel when cut, even if you don’t reinforce it. Other kinds of grabby wool will be fine with a crocheted reinforcement, the crochet chain running down either side of the steek “hugs” the yarn and holds everything in place after it is cut. Other wools that are more slippery, like merinos and superwash, really need to be reinforced by a couple of lines of sewing machine stitching running down either side of the steek. I went wrong was in thinking that my project would be okay with a crochet reinforcement. It was not okay. 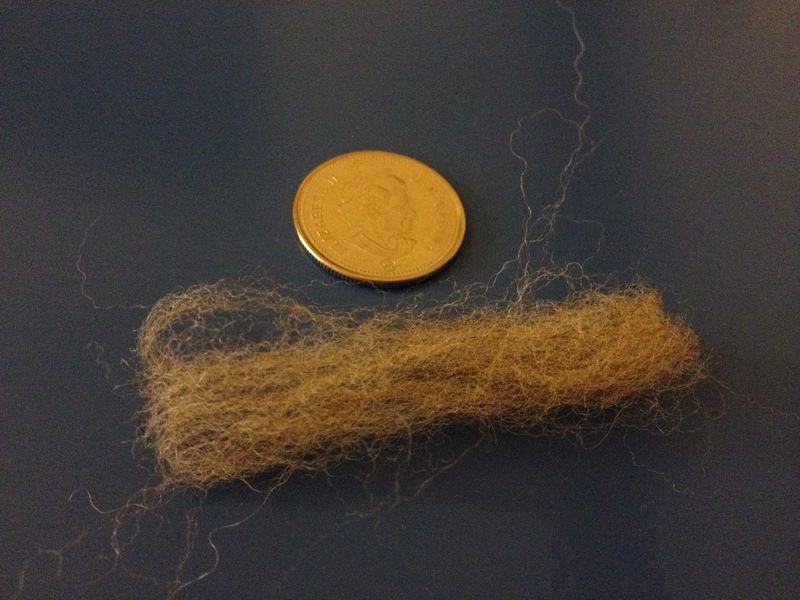 I also should have taken the time to test it out on my swatch before taking the scissors to my sweater, but I did not. This disaster was avoidable, which makes it all that much more horrific. I’m going to chalk these mistakes up to lessons learned and move on. Since this was for a pattern I was designing, and I had planned on adding a little picture tutorial on steeking (yes, I appreciate the ridiculousness of that), I have thorough photo documentation of the disaster as it unfolded. Warning: the following pictures portray unwanted unraveling, viewer discretion is advised. 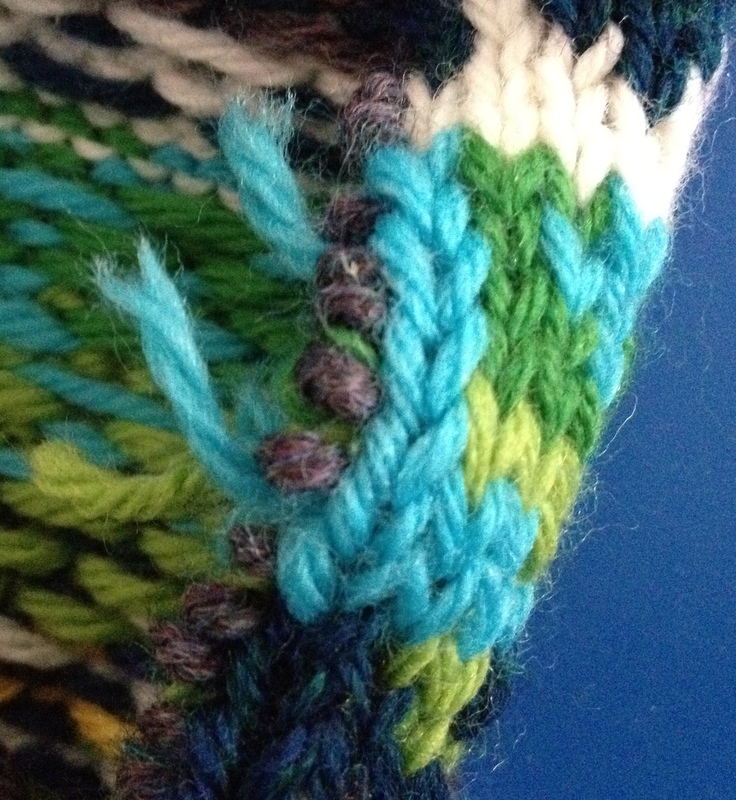 First you crochet a chain through the column of stitches to one side of the steek. Then do the same to the column on the other side of the steek. Then you cut down the steek column between the two reinforced columns. Remember, you spent countless hours knitting the piece up to this point. And then, if you’re yarn is too slippery, it will pull out of its crochet “hug” and unravel when you try to pick up stitches for the button band. So the moral of the story is, always machine reinforce your steeks or you could end up with unwanted unraveling. I think I have a solution to the problem so stay tuned for updates on the steeking saga. I have been one busy lady lately. All work and no play makes me fairly happy actually, but I must confess that the meals I’m putting on the table have been a little lacking. Tonight I boiled some pasta and threw in a jar of sauce. Everyone knew better than to complain too much. But, I am getting a lot of stuff done. 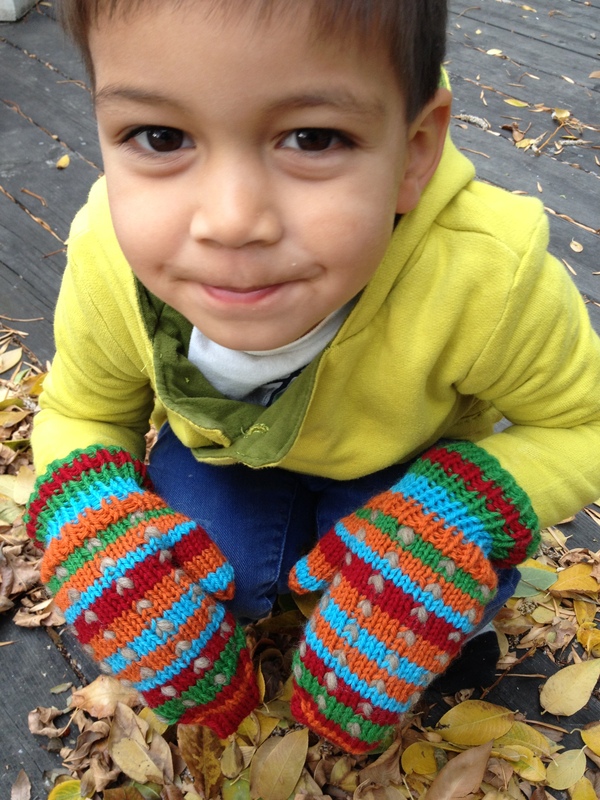 A little over a week ago I managed to finish another pair of thrummed mittens for my friend’s other little boy. The boys are very close in age and their hands aren’t that different in size so instead of adding another repeat to the pattern I just went up to a size 6 needle (rather than the size 5 I used for the smaller ones). This gave me an extra 1/2″ in width and height, which was just about what I needed. 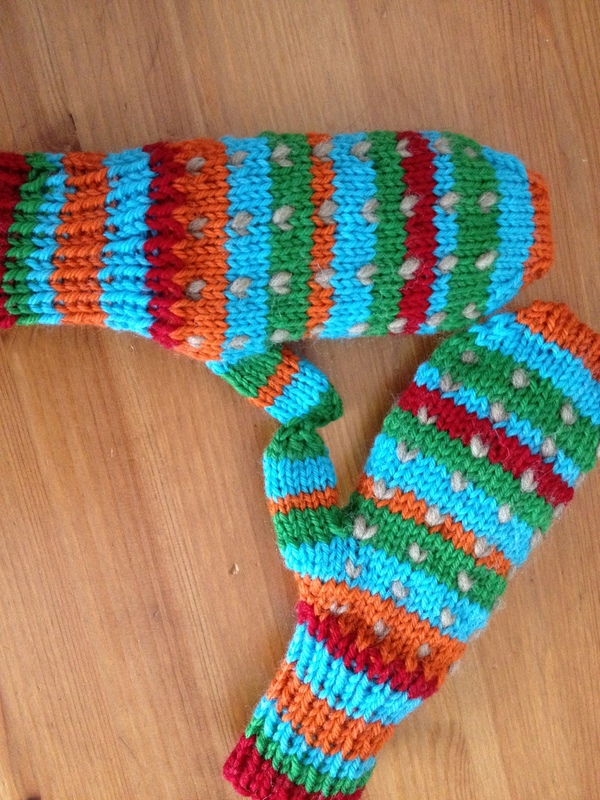 I chose another random stripe pattern but with the same colours, so the mittens would be similar but different enough that they would know whose were whose. I delivered them last week, but apparently the boys are not big fans of the feel of the thrums on the inside so we are considering lining them. 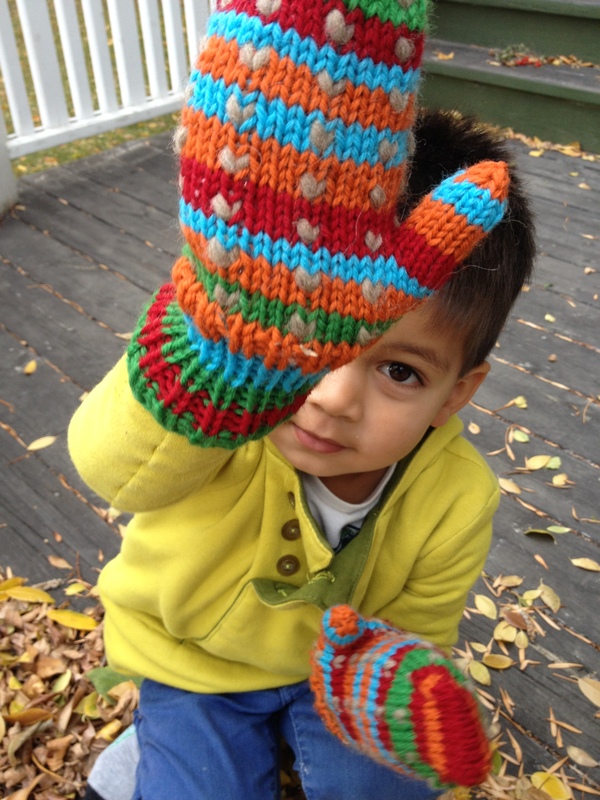 I was recently commissioned by a friend to knit some thrummed mittens for her and her two boys. 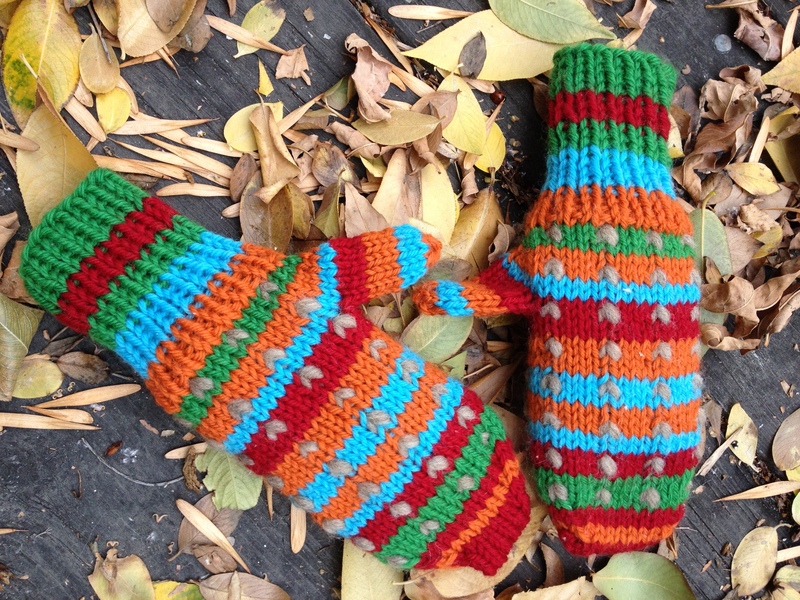 They are wonderfully warm mittens, perfect for these frigid Cow Town winters. I still had lots of bright colours of Cascade 220 and some taupe-coloured Merino roving left in my stash so I was able to start on them right away. I decided to do them in a random stripe pattern of four colours. Since I’m terrible at being random or overly creative when it comes to these things, I hit up the handy-dandy Random Stripe Generator, input the colours and rows I wanted, and refreshed away until I found a pattern I liked. Also, since I have a terrible memory, I looked up the Yarn Harlot’s thrum tutorial. Then I did a swatch to figure out how many stitches and rows per inch (aka stitch gauge and row gauge) I had for my yarn and needle choice and did a little math to determine how many stitches I needed. 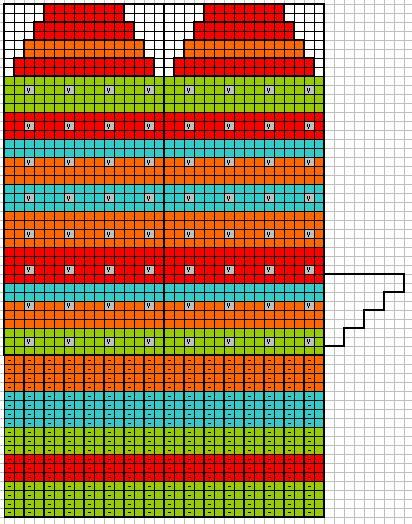 I made a chart in Excel and added my stripes, thrums, thumbs and decreases and badda-bing, badda-boom, I had myself a pattern. I’ll include the chart here for anyone who might be curious, but with the warning that you have to do some reading between the lines (or just go ahead and ask me questions) if you’re going to try and make a mitten from it. I’m also going to show a little detail on how to make thrums. The V’s represent where the thrums are added. Dashes are purls. And now a brief tutorial on how to make a thrum. The usual advice is to make up a bunch so that you can just reach for them when you need them, and that is certainly most efficient, but I am neither usual nor efficient. 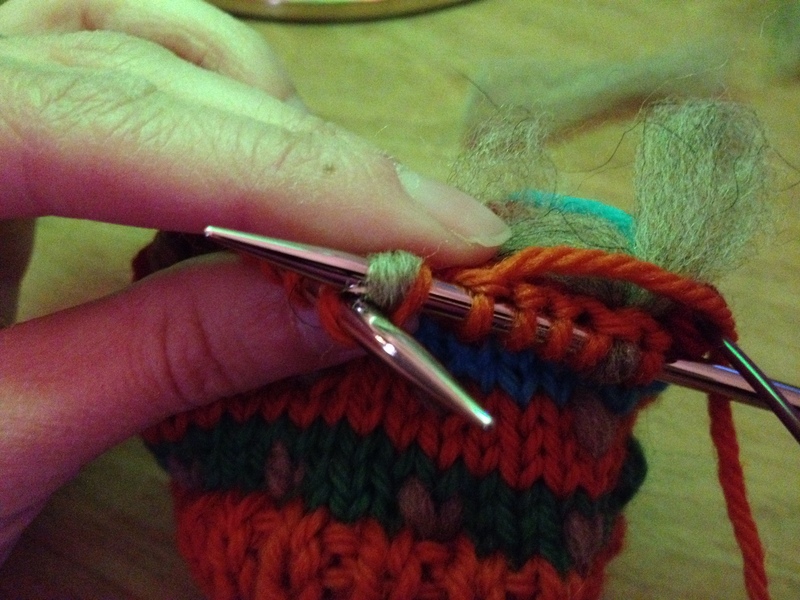 I usually make enough for a row when I get to a thrum row, it breaks up the monotony. 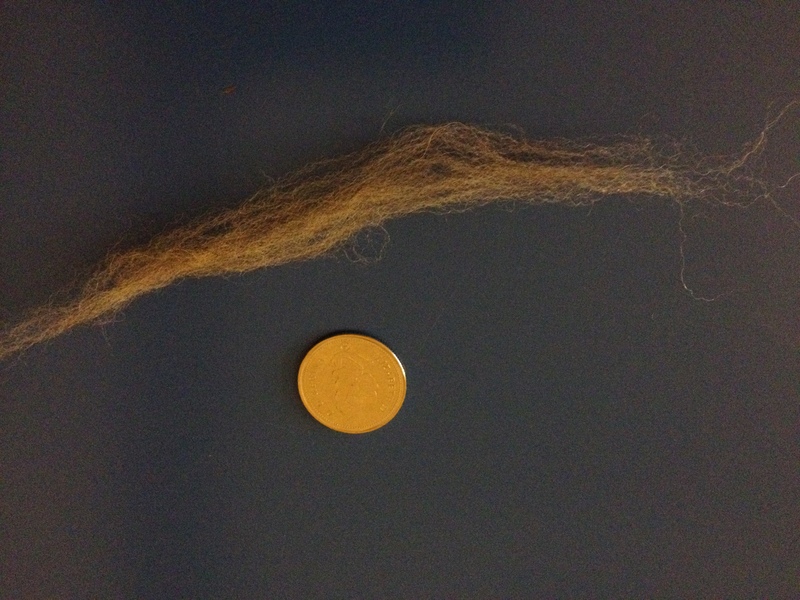 Pull off a small piece of roving about 3 inches long (our lovely Queen for scale). Fold each end in to the middle. Give it a twist. I like to give mine a little more twist just as I’m about to use it as I find they like to untwist if left to their own devices. 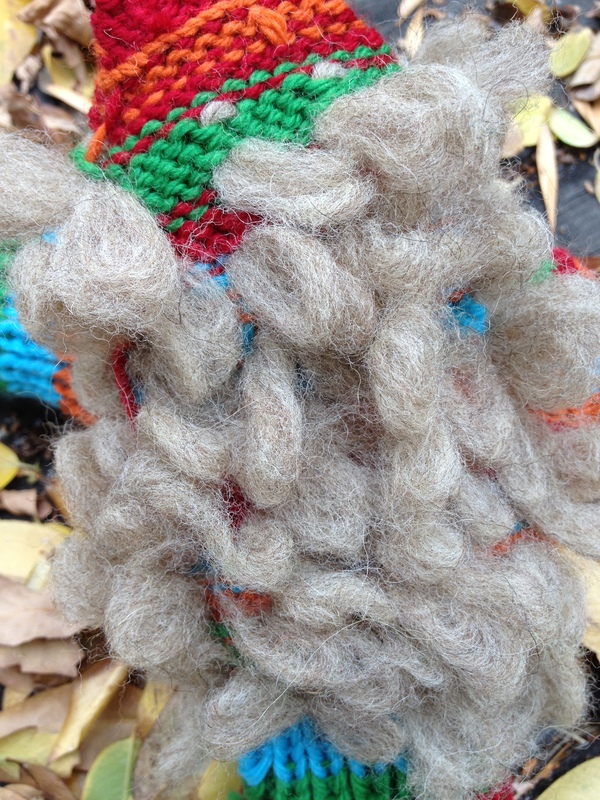 …then pull the yarn and thrum through the loop as usual. 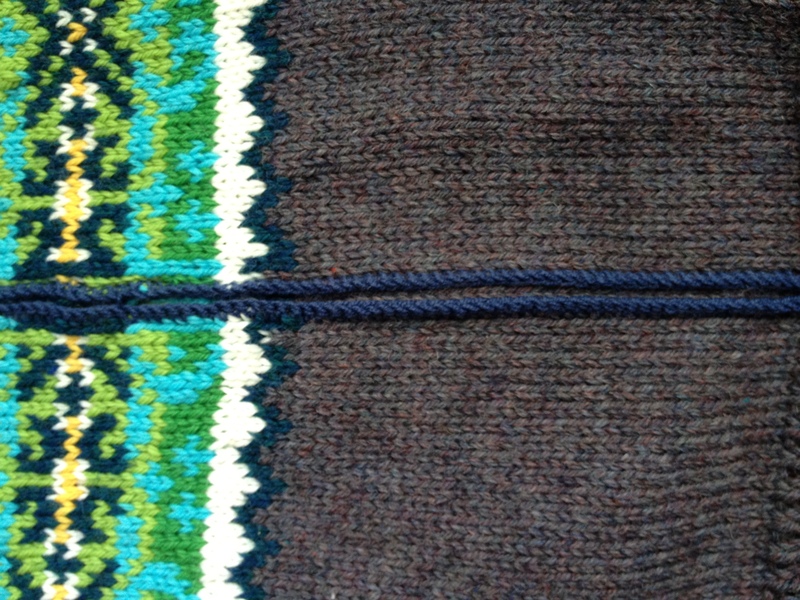 On the next row, knit the thrum and yarn together through the back of the loop. And then you knit and knit and knit some more. And then you have oh-so-cute, oh-so-warm mittens. Since it is mid-October I’m having a bit of a crafting crisis. 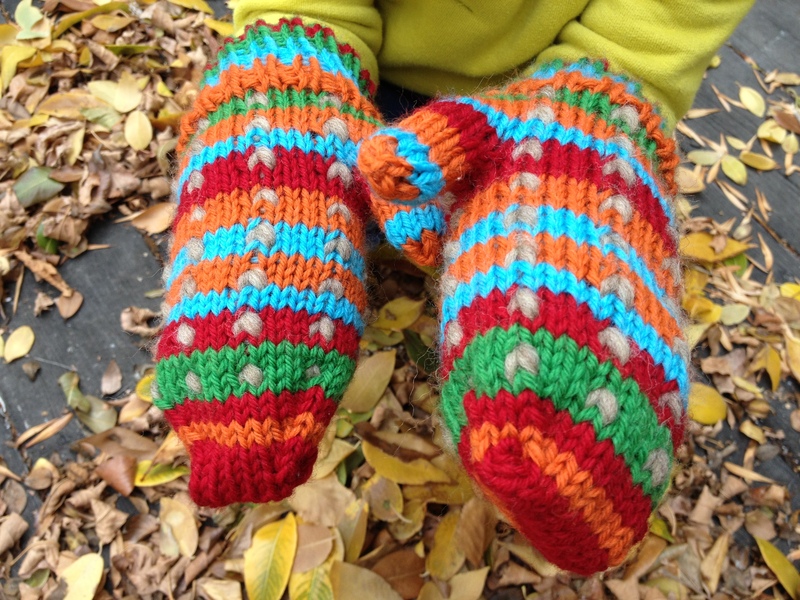 On one hand, we woke up to an inch of snow here yesterday so I am kicking mitten and hand production into high gear. P’s head and one hand are covered, but that other hand is still out in the cold for now. I’ve come up with new hat and mitts designs that are being tested right now. They are fairly simple and quick so I’m hoping to release them as free patterns that I’ll post on the blog as well. More on that to come. But this year I own a sewing machine, and even kinda know how to use it. 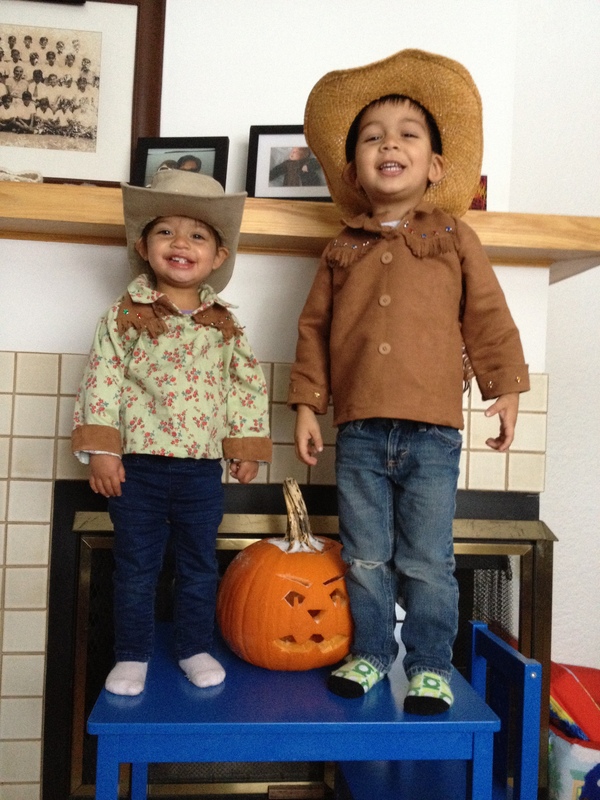 So I went out the other day and picked up this Simplicity pattern and plan to make the kids cowboy/girl costumes. I figure they can double-up as Stampede outfits next year. I’ve decided to skip making the pants and skirt, they can just wear their regular jeans, so I’m only making the shirts. As I was looking through the fabrics I realized that if I’m going to be making a shirt, why not make it something durable and nice that can be worn everyday. 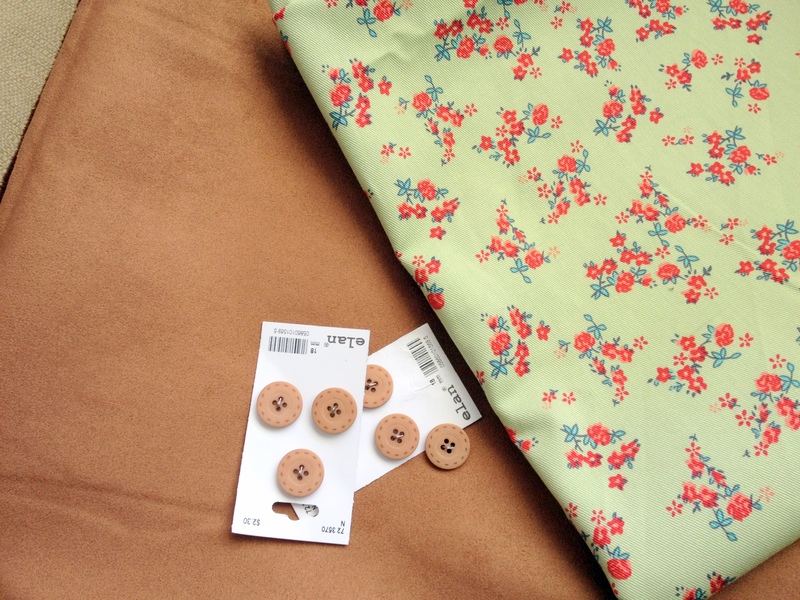 So I bought these beautiful fabrics and I’m going to use buttons or snaps instead of the velcro the pattern calls for. I’m hoping to get working on them this weekend, so maybe next week I’ll be able to post the finished product.